The Arizona Cardinals have played well under head coach Bruce Arians, and with a solid 2015 offseason in which they added veterans Mike Iupati, LaMarr Woodley, Cory Redding, Corey Peters and Sean Weatherspoon, the Cardinals should be contenders for the NFC West title. The loss of Darnell Dockett, Dan Williams, and Antonio Cromartie will sting a little, but the organization feels confident it has the players in place to fill his void. Key additions: G Mike Iupati, C A.Q. Shipley, DE/DT Cory Redding, DE/DT Corey Peters, DE/OLB LaMarr Woodley, ILB Sean Weatherspoon. Key losses: TE Rob Housler, G Paul Fanaika, C Lyle Sendlein, DE/DT Darnell Dockett, DE/DT Tommy Kelly, NT Dan Williams, DE/OLB Sam Acho, DE/OLB John Abraham, CB Antonio Cromartie, KR Ted Ginn. The Cardinals have a solid core of skill position players on offense, including Palmer, Fitzgerald, Floyd , Brown and Ellington. They also added rookies D.J. Humphries (OT) and David Johnson (RB) to solidify positions of need. Unfortunately, the Cardinals play the Seahawks and Rams twice each, so don't expect huge numbers in those divisional games. 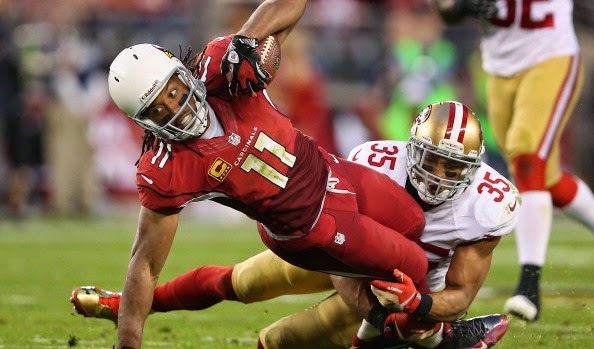 The Cards do have plus offensive matchups against the Saints, Bears, Steelers, 49ers x2, Eagles and Packers this year. As long as they can avoid injuries, we expect solid numbers from most of the Arizona offense in 2015. The Arizona defense was extremely good in 2014, ranked 5th in the NFL in points allowed, and 9th in the in yards allowed. The team has a nice group of players at every level, including some pro-bowl caliber studs. The addition of LaMarr Woodley, Cory Redding, Corey Peters and Sean Weatherspoon should all help the depth on the squad. We expect solid stats again in 2015.